In October 1963, Stanley Tretick took remarkable pictures of President John F. Kennedy and his children for a Look magazine article, “The President and His Son.” Several of these photos, including some not previously published, appear in Capturing Camelot: Stanley Tretick’s Iconic Images of The Kennedys. 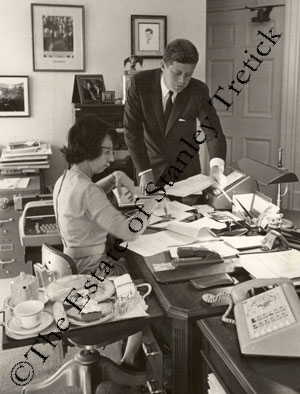 The John F. Kennedy Presidential Library and Museum has posted audio files of Stanley Tretick speaking about the project on the phone with JFK’s secretary, Evelyn Lincoln. The JFK Library does not give a date for the White House recording but internal evidence indicates the call took place in the latter part of August 1962. In this call, Tretick tries to set up a date for the photo shoot. Failing that, he asks Mrs. Lincoln, “Do you think it would be OK if I sent him a note after this weekend and say, when you think you would like to do it?” Tretick sent a reminder to JFK on September 5, 1962. “The President and His Son” was the cover story for Look December 3, 1963, which appeared on newsstands 4 days before the president was assassinated on November 22. Tretick refers in the phone call to an article about Mrs. Lincoln that ran in Look October 9, 1962.
who had worked for him since 1953. Permission for use of photos must be obtained from the Estate of Stanley Tretick. *Audio files courtesy of John F. Kennedy Presidential Library and Museum, Boston. If you have trouble with the audio on this page, the following are the relevant pages at the JFK Library website.